Enjoy the romantic setting of a cruise for your honeymoon or if you are celebrating a wedding anniversary or have recently been married you may want to renew your vows at sea? I arranged our own wedding blessing at sea during a recent cruise onboard P&O’s Oriana, and I know how important attention to detail can be on such on such an important day. Let me help to take away some of the strain of such an important day in your life and allow me to help you to arrange your day how you want it. Many cruise lines now offer weddings at sea or whilst in port and all sorts of packages can be arranged to suit your needs. Hundreds of nautical miles out at sea, lisa Hatful experiences, first hand. 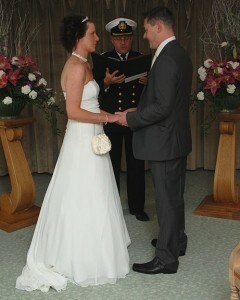 A personal and beautiful romantic wedding ceremony conducted by the ships Caprtain. 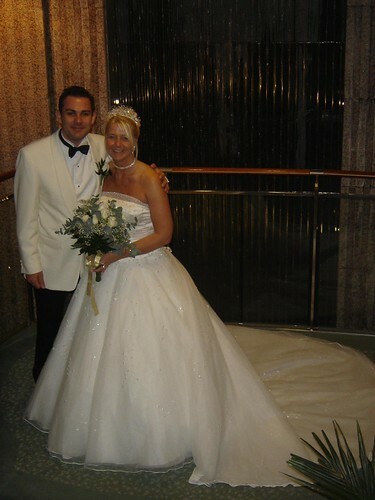 What first inspired you to consider getting married on a cruise ship? 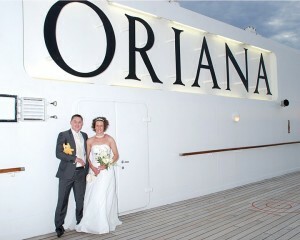 We always wanted to have a romantic, simple wedding with just the tow of us and after seeing our travel agent GoCruisewithJane’s photographs of her wedding blessing onboard Oriana we knew a wedding at sea would be perfect. Why did you choose P&O Cruises? 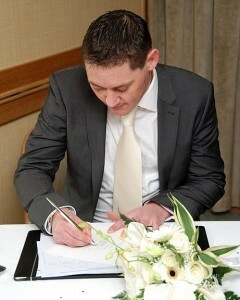 Having sailed with P&O Cruises previously we knew we would have a fantastic wedding and honeymoon. What was a real ‘WOW’ for you? Being treated like VIP’s for the whole cruise, not just the wedding. We were bought drinks and sent flowers and cards from passengers and staff who we had only just met! And we were even applauded as we entered and left the restaurant on the day of our wedding. It was tropical night that night so there was a real party atmosphere on board. It was like having a huge wedding reception! We felt like celebrities. The staff were amazing, as always, but just went that extra mile for the whole cruise to make it truly special. Captain David Pembridge conducted the ceremony and our witnesses were Natalie Brady, loyalty & Cruise Sales Manager and Hannah Page, assistant Food & Beverage Manager/Wedding Coordinator. Our best man was our mascot bear, Vince! What were the advantages of a wedding at Sea? It was so easy! All I had to do was choose a dress and turn up. All the planning and preparation was completed for us and as soon as the ceremony was finished we were on our honeymoon. Having our wedding photographs taken. It was fantastic, we had such fun parading around the ship! How do you think it compared in terms of cost to a land based wedding? Excellent value for money. I don’t think anyone could ever have a wedding like ours ashore for the money we spent. Who looked after your wedding plans for you onboard? Hannah Page. It was her first post as a wedding coordinator and she was lovely. We met before the ceremony to run through the vows and music. She also offered to book and appointments that I wanted in the salon and spa. What did you do in the run up to your wedding day? Our ceremony was at 3.00pm so after having a leisurely breakfast on our balcony we relaxed on deck until it was time to start getting ready. What ‘extra touches’ did you have? I had a tropical hand-tied bouquet which was gorgeous and we opted for the ultimate photography collection, which was an amazing momento of the day. Would you recommend a P&O Cruises Wedding? Most definitely! I cannot recommend it enough. What top tips do you have for other couples considering a wedding at sea? Book it! You will definitely not be disappointed. If you want a stress free wedding day, stunning wedding photographs, VIP treatment and amazing honeymoon destinations, a wedding at sea will be a perfect wedding for you! Lisa and Steves wedding was incredibly personal, so they decided that it would be just the two of them (with witnesses)at their wedding. Other wedding parties have been made up of families and friends. If you wish to travel as a group you can take advantage of P&O Wedding Savers, offering and additional 5% discount on the adult brochure fare of your chosen itinerary for groups of ten adults or more. 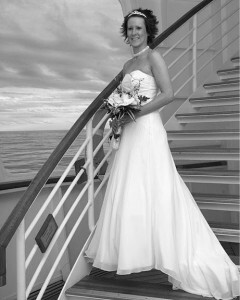 My own ‘Wedding blessing at sea’ consisted of 30 guests. I chose to ask everyone to adhere to a formal dress code on an ‘informal’ evening. We had a champagne reception, followed by a pre dinner drinks reception and speaches, followed by a wonderful evening meal for all 30 guests seated together in a sectioned off part of Le Jardin Bistro onboard Oriana. As Lisa said, the crew were wonderful. Nothing was too much trouble and we had everything exactly how we wanted it for our special day. You can read more about my own Wedding Blessing at Sea on the Celebrate at Sea page and watch a short video clip. 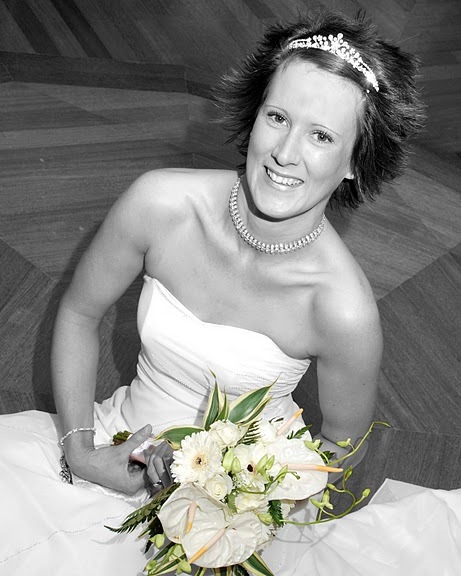 For more information and assistance with booking your Wedding or Renewal of vows at sea, contact me now for my personal assistance in arranging one of the most important days in your life!